1973-04-05. New. Ships with Tracking Number! INTERNATIONAL WORLDWIDE Shipping available. Buy with confidence, excellent customer service! 1994-08-07. New. Ships with Tracking Number! INTERNATIONAL WORLDWIDE Shipping available. Buy with confidence, excellent customer service! 1985-02-01. Good. Ships with Tracking Number! INTERNATIONAL WORLDWIDE Shipping available. May not contain Access Codes or Supplements. May be ex-library. Shipping & Handling by region. Buy with confidence, excellent customer service! Elek. Hardcover. 0236154613 New Condition. . New. Book Club Associates. Hardcover. 0882250906 New Condition. . New. Boston: G. K. Hall. 1974. First Edition Thus; First Printing. Hardcover. 0816162352 . Very Good- in a Good price clipped dust jacket. Spine is cocked. A few tears to jacket crown. Discoloration to jacket. LARGE PRINT EDITION. ; ; 8.60 X 5.60 X 1.40 inches; 224 pages; Original dust jacket protected by archival Brodart cover. All domestic orders shipped protected in a Box. .
1973-04-04. Good. Ships with Tracking Number! INTERNATIONAL WORLDWIDE Shipping available. May not contain Access Codes or Supplements. May be ex-library. Shipping & Handling by region. Buy with confidence, excellent customer service! Elek Books. Hardcover. B00NBMM1TM 1974 reprint, shelf wear to dust jacket . Good. Elek. Hardcover. 0236154613 Like New Condition. . Fine. Book Club Associates. Used - Acceptable. Ships from the UK. Former Library book. Shows definite wear, and perhaps considerable marking on inside. 100% Money Back Guarantee. Your purchase also supports literacy charities. Toronto: Griffin/Elek, 1973. Pale blue boards the titles in bright gilt to the spine.A well cared for copy.There are no marks of any kind.a great story of survival in a small boat/raft... First. Hard Cover. Near Fine in a Like Jacket. Illus. by Mapped End Papers, Line Drawings Etc.. 8vo - over 7¾" - 9¾" tall. London : Book Club Associates. Used - Good. Ships from the UK. Shows some signs of wear, and may have some markings on the inside. 100% Money Back Guarantee. Your purchase also supports literacy charities. Praeger Publishers, 1973-01-01. Hardcover. Good. Toronto: ON: Griffin House, 1973. 8vo-over 7Â¾"-9Â¾" tall. pp.223. One of the most astounding survival stories ever to be told when in 1972 a 19 ton 43 foot schooner sailed by an ex farmer and his family was sunk in 60 seconds by killer whales in the Pacific. clean tight copy slight edge and corner wear of minuscule creases covers show indentations of shadow writings.. First Edition. Hard Cover. Fine/Very Good. New York, NY: Praeger Publishers, 1973. 1st Ed. Hardbound. 8vo. 369 Pgs.. Nr Fine in Torn DJ/Fair. 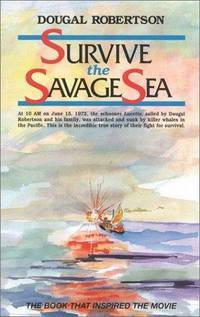 Survive the Savage Sea by Dougal Robertson. Published by Praeger Publishers, New York, NY, 1973. 1st Edition. Hardbound, Paper DJ. Size 8vo (up to 9-1/2'' tall). Condition: Nr Fine in Torn DJ. 369 Pgs. ISBN 0887600492. LCCN 73-30. True story of 1972 the author and his family survived an attack by killer whales. Illustrated with drawings and photographs. Description text copyright 2005 www.BooksForComfort.com. Item ID 9701. Praeger. Used - Good. Ships from the UK. Former Library book. Shows some signs of wear, and may have some markings on the inside. 100% Money Back Guarantee. Your purchase also supports literacy charities. Condition: Very good condition in fair d.j. Toronto, Ontario: Griffin House, 1973. Book. Very Good. Hardcover. Canadian First. Some edge wear to boards and dust jacket; otherwise a solid, clean copy with no marking or underlining; collectible condition; illustrated with black and white photographs, drawings and maps..
G. K. Hall, 1974. Hardcover. Good.